Gondar is the one city in Ethiopia's history that has played the role of the honorable exception between ancient Axum and modern Addis Ababa. It was the only permanent capital to last any considerable length of time. It was founded in 1636 by Emperor Fasiladas and served as the capital city till Tewdros's time, mid-nineteenth century. Its special distinction is for having the unique Imperial compound that hosts a number of castles built during this period. The most famous buildings in the city lie in the 17th century royal enclosures, including Fasilades castle, Iyasu's Palace, Dawit's Hall, a banqueting hall, stables, Mentewab's castle, a chancellery, library and three churches. Near the city lie Fasiladas' bath, home to an annual ceremony where it is blessed and opened for bathing; the Quasquam complex, built by Empres Mentewab; the eighteenth century Ras Mikael palace and Debre Berhan Selassie church. 1. In the extremely cut-up and isolated parts of the north and centre of the country, the tendency on the part of the regional lords was to assert their independence if the emperors did not make their presence felt. Therefore, the emperors had to move and make their presence felt in different parts of the country in order to retain the loyalty of the different kings and lords. 2. The second reason was to the need to move in order to be close to supplies of firewood. These tended to run out if the court stayed too long at one particular spot. So, movement was very essential. 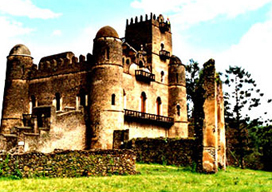 Gondar flourished as the only permanent capital during all this time. Towns like Emfraz, Ayba, Gorgora and Denkez flourished as semi-permanent encampments in the century before the founding of Gondar. Gondar town served as Ethiopia's capital until Tewedros II moved the Imperial capital to Magdala (having forcibly depopulated the city and destroyed much of the infrastructure) upon being crowned Emperor in 1855. Abdullahi ibn Muhammad sacked Gondar when he invaded Ethiopia in 1887. Gondar was further developed under Italian occupation; during the Second World War, Italian forces made their last stand in November 1941. 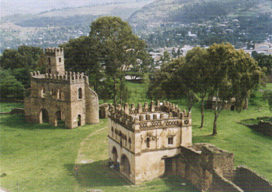 Gondar is also noted for ecclesiastical learning in the Ethiopian Orthodox Church.